ABOUT US - Licensed Home Child Day Care located between George Dieter and Lee Treviño, close to Vista del Sol at East Side of El Paso, TX. 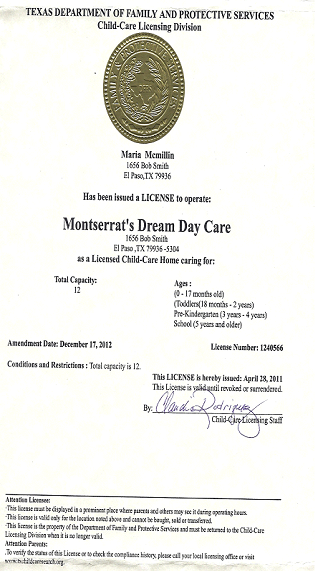 Safe and loving environment at MONTSERRAT'S DREAM DAY CARE, children will feel like at home. Children will learn while they play, numbers, math, colors, shape, alphabet, writing, language games, music, creative activities. We have large toys room and a really nice back yard. We play outside every day and when the weather is nice, we are outside both morning and afternoon. 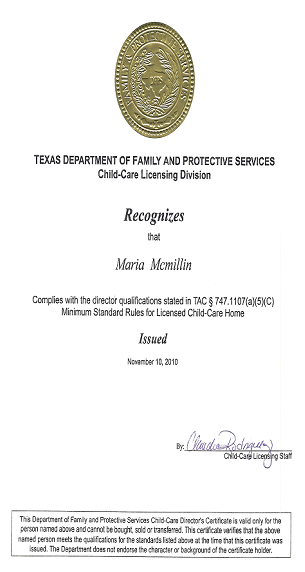 Owner complies with the Director qualifications stated in TAC 747.1107 (a) (5) (C) MINIMUN STANDARD RULES FOR LICENSED CHILD - CARE HOME (College credit hours with college credit hours in child development and college credit hours in business management). Also, owner has a bachelor degree in Accounting and a bachelor degree in Computer Science, and is CPR, first aid certified and participate in food program offering healthy AM snack, lunch, and PM snack.